The preset location address: De Spuches 4 Carini, Carini, Italy, area 'Carini - Downtown'. -by using the Palermo interactive map on the left. Car and options choice. The search results indicate valid and final rental rates at the 'Carini - Downtown' location. The rates are formed on the 'All included' principle. Presented prices do not include additional options, such as a GPS navigator, child seats, winter tires, etc. They can be added later on, during the last phase of the booking process. Car pick-up. Upon arrival to the location 'Carini - Downtown', provide the required documents specified in your voucher to the rental officer. Directly in the office, inspect the rental invoice carefully – should match with your voucher. Besides this, do not forget examine the car exterior carefully – all defects discovered at the pick-up time should be included in your rental document. Another remarkable landmark of Palermo is the Porta Nuova. The gate serves as a symbolic entrance to the historical center of the city. The gate was built in the second part of the 17th century. The construction presents a complex architectural composition of ingenious statues, large stanzas and pyramid shaped cupola. 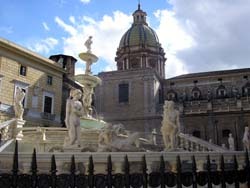 The most remarkable and significant historical landmark of the 18th century is the Orlean Palace which serves as the main residence of the president of Sicily from the 1947.